I've stayed there as well, excellent food. Really liked the room and my wife went mad for the Spa and pool. How can they do it for that price, might do this for our 20th anniversary. 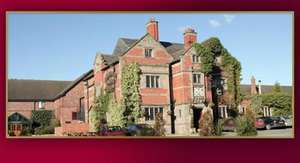 Nice place but I thought the deal was for the Grosvenor in Chester which is superb, but gutted it just for the one in Pulford. The rooms can normally be had for cheaper than this through late rooms (if you ask the receptionist she tells you to book through a site as its cheaper) but heat for the £50 meal voucher as Ciro's is very good. Presume using the pool and spa would be extra though? EDIT: All hotel guests have complimentary use of the swimming pool, Jacuzzi, sauna, steam room, gymnasium and tennis court.